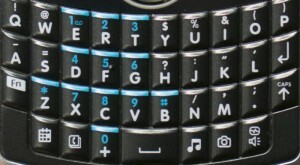 QWERTY is a standard layout for letter keys on text keyboards and thumboards. Originally created for typewriters, it is currently the layout found on most english-language computer keyboards. It is named for the order of the first six keys on the top row, which happen to form a pronounceable word. On phones, the keys are usually much smaller and closer together. This means they cannot be used with two full hands like full-size keyboard, but rather are designed to be used with two thumbs while holding the phone. Even though traditional touch-typing is not possible on a phone's small QWERTY keyboard, the familiar layout makes it easier to find the correct letter among a large number of keys. The same layout is standard for English-language virtual keyboards on standard touch-screen smart phones. Generally, they can be used with one or two thumbs. Some can also be used by swiping a thumb across all letters of a word in one stroke.